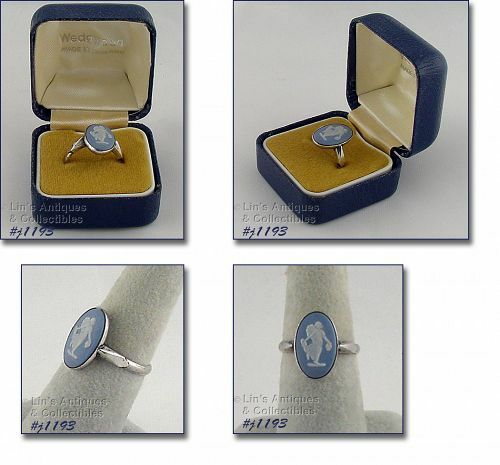 This listing has another vintage Wedgwood cameo silver ring from my collection! Ring is size 7, the Jasperware cameo measures 11/16” x 1/2", and it’s marked Wedgwood Made in England. The band is hallmarked: JW, full figure lion, tiger head, and the letter D.
Ring is in the original Wedgwood box! This listing has a vintage Wedgwood silver ring that I purchased at an antique shop many years ago! 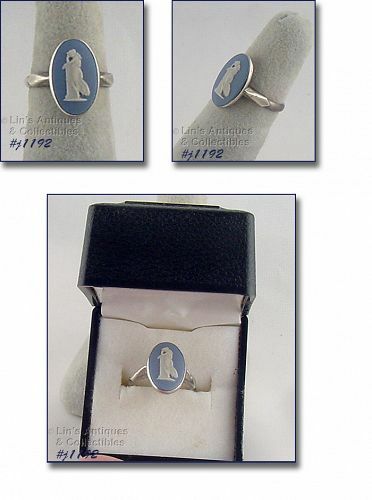 Ring is size 5 1/2 and the Jasperware cameo measures 11/16” x 1/2". It’s marked Wedgwood Made in England. The band is hallmarked: JW, full figure lion, tiger head, and the letter B. 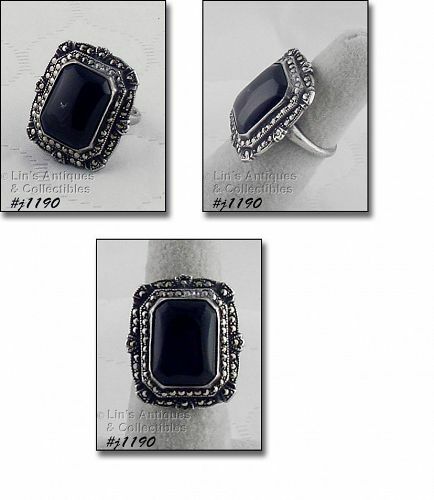 This listing has a beautiful vintage estate sterling ring! The ring is size 7, the top measures 1” x 1”, and the center stone is 3/4" x 1/2". This listing has a yellow gold ring mount – just waiting for your diamond or gemstone! 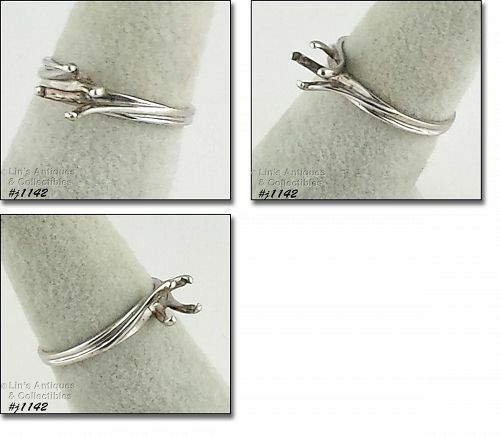 Ring is size 4 ½ and the band measures 1/16” wide. It has a 4 prong setting that measures 1/4” prong to prong. This listing has a 14k yellow gold engagement ring with a 3 – 4 carat cubic zirconia (man-made diamond). Ring is size 6 ½, marked 14k W, and band is 1/16” wide. This stone is marquise shape and measures 5/8” x 1/4" for an estimated carat size of 3-4 carats. Again, I am not a jeweler so please be aware these are my estimates only. 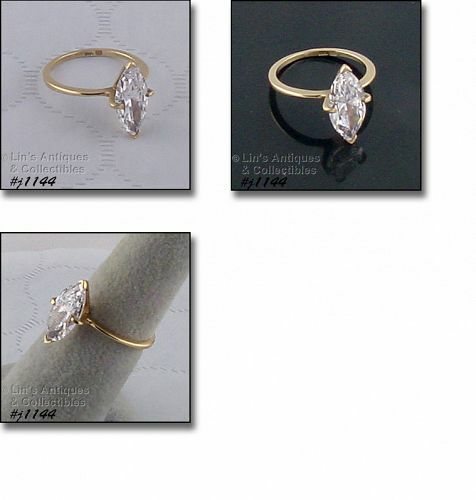 This listing has a 14k yellow gold engagement ring set with a 3 ct man made diamond/cubic zirconia. Ring is size 5 3/5, marked 14k, and band is 1/16” wide. Using a 10x loupe, I can see 2 small “dings” on edge of the stone but it is visually clean to the naked eye. 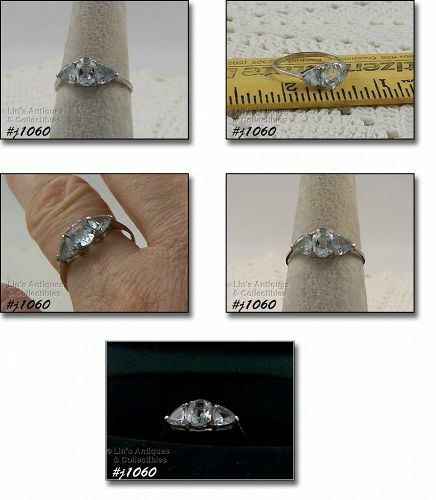 This listing has a very pretty diamond ring! 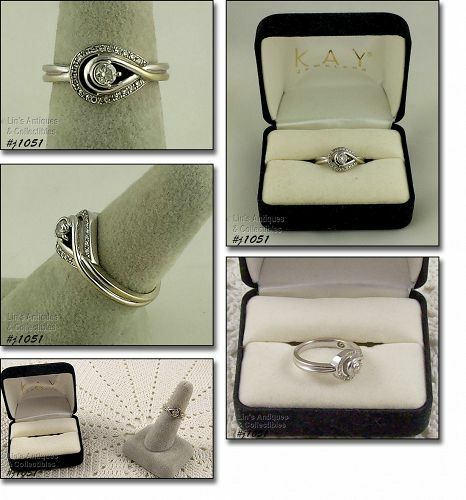 It’s white gold, size 6 1/2, and was sold by Kay Jewelers. My research shows this ring is from a retired Kay Jeweler’s collection titled “Love’s Embrace”. The ring was described as a round diamond in the center of a diamond decorated teardrop. I purchased a large number of jewelry items at an estate sale -- this earring was among those purchases. Earring is stamped 925 China and it has a large clear solitaire setting that I assume is a cubic zirconia/zirconium but I really don’t know (it is not a diamond but could be a topaz, zircon, or just sparkly glass!). 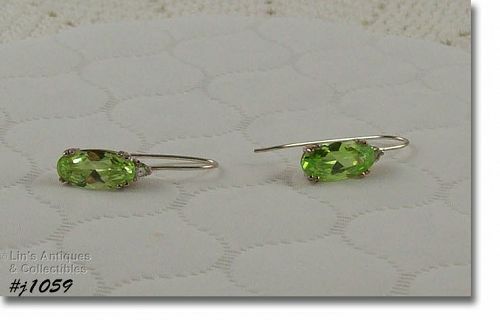 It measures 1/2" diameter and weighs 3.9 grams – not a little earring by any standards. I would estimate it to be in the 5-7 carat size range. This is a very pretty garnet ring! It’s 10k yellow gold and has 5 marquis cut garnets set in a step type mounting with the center garnet being slightly elevated. The garnets measure 5/16” x 1/8”. The band measures 1/16” at bottom and ring weighs 2.2 grams. Band is marked 10k SANUK. Very pretty right hand ring or could be worn as a wedding band! 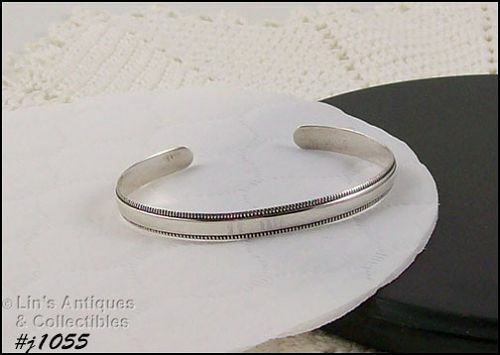 This listing has another very pretty silver bracelet! It measures 7 1/2" long, 3/8” wide, and is stamped 925, China. Bracelet is very well made and has a hidden jewelry clasp with safety latch. It is made in such a way that it appears to have diamonds, it does not. Bracelet coordinates beautifully with our #J1056 silver bracelet. Another beautiful right hand ring that would be a gorgeous engagement ring! 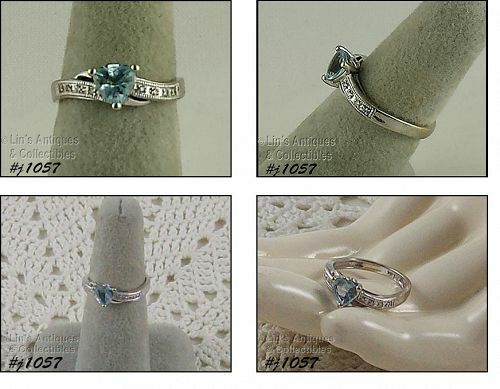 This one has 3 blue topaz gemstones – an oval center stone with a trillion cut gemstone on each side. The oval stone measures 5/16” x 1/4”, the trillions are 1/4”. This is an elegant feminine ring. It measures 5/16” wide, band is marked 10k and measures 1/16” wide at bottom. Ring weighs 1.4 grams. This listing has a 10k white gold ring with 3 tanzanite gemstones! The center stone is oval with small accent diamonds and it has a pear shape tanzanite on each side. Ring is size 7, measures 1/4” wide, band measures 1/16” wide at bottom and it’s marked 10k. It weighs 1.6 grams. This is such a pretty ring! It’s 10k white gold with a trillion cut light blue topaz with 8 diamond accents! Ring weighs 2.6 grams, is size 6 1/2, band is stamped 10k, and the band measures 1/8” wide at bottom. This is a beautiful right hand ring and would also be a beautiful engagement ring! 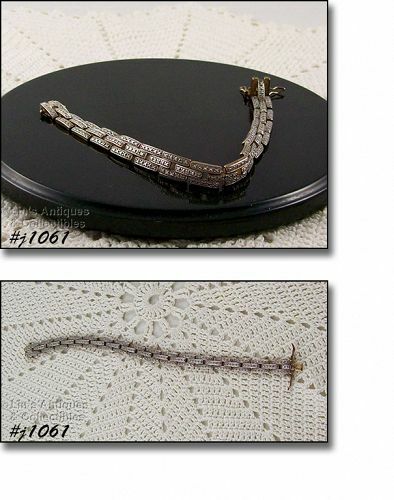 This listing has a very pretty silver bracelet! It is gold tone, has sparkly cubic zirconiums, measures 7” long, and weighs 12.6 grams. It is very well made with hidden jewelry clasp and safety latch. Clasp is marked 925, China, CZ. 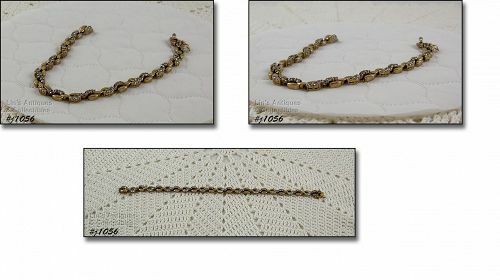 This listing has a lovely silver bracelet! It’s cuff style with beaded design on edges for extra eye-appeal. Bracelet is stamped 925, measures 1/4” wide, and weighs 7.9 grams.